Mary Sakyibea had her cleft lip repaired in December 2005. At the time, she was 18 years old and was living in the Eastern Region of Ghana. She has benefited from other interventions, particularly dentistry. Mary is a very confident person and is determined to better her lot by learning a trade, even though she could not carry on to finish her formal education as she intended. 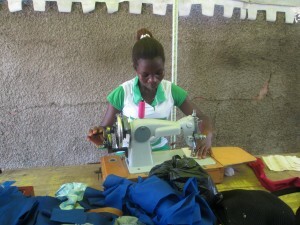 She has relocated to Accra where she now works as domestic help and learns sewing. When Mary, the project’s Administrator in Accra, caught up with her, she was busy behind her sewing machine.